and bilingual education expert Karen Nemeth, Ed.M. I am writing in support of the nomination of Sholeen Lou-Hsiao for the Pedagogical Leader category of the Irene Bandy-Hedden Leadership Award. My qualification for writing this recommendation is that I have an M.Ed. from Rutgers University with specialization in language acquisition. I am currently the director of a consulting practice on supporting language learning in young children, and I was recently employed as the expert on preschool English language learners at the New Jersey Department of Education. I met Sholeen when she first began sharing her passion for helping young children learn the Chinese language. She had a clear vision about using a game to put language acquisition theory into practice in a form that would be both engaging and educational for children as well as their parents and teachers. I was very impressed with Sholeen���s attention to all of the details that made her game an outstanding contribution to the field of teaching languages to young children. Through constant study and innovation, Sholeen has gained significant expertise in the field of second language acquisit ion and home language maintenance within the context of the most current views on developmentally appropriate practice. She has used her expertise to develop additional language education materials that are used in homes and schools throughout the United States and in other countries as well. The quality of these materials far exceeds anything else available to teachers and families today. Sholeen has dedicated herself to ensuring that every aspect of her product is solidly research-based and educationally valid. In addition, Sholeen is a sought-after speaker at conferences and educational events in the US and abroad. She has influenced the teaching practice of many teachers by sharing her guidance about best practices for supporting young language learners. Her unique leadership has helped so many families and educators to achieve their educational goals for their children to grow up with the advantages of being bilingual. I believe Sholeen Lou-Hsiao is an innovator who is making a broad contribution to the field of education even as she continues to touch the lives of the individual teachers and parents she works with. She is the perfect candidate for this leadership award. By using the Kingka game, a matching and memory game, kids with special needs can learn the most used language on earth: Mandarin Chinese. This game was created by a Chinese-American mom, who is also an author of children���s books and an education in New Jersey. Her name is Sholeen Lou-Hsiao and it is the first ever North American board game that uses Chinese characters as its key element. Lou-Hsiao also said that the game was created because her son is ���impatient��� and so it was designed to keep him engaged. Professor Andreas Demetriou of Department of Educational Sciences at the University of Cyprus, learning the logographic Chinese writing system stimulates spatial perception, which some kids with developmental disorders have trouble with. It also helps develop the ���Right Brain��� which is used with vision and not when reading English. Thomas, age 11 and Brandon, age 8, both of whom have been diagnosed with autism, sat down with the Kingka game to play it. Thomas was not as interested as Brandon to learn a new language but he was interested in playing a puzzle game. The uniqueness of this game allows 1-6 players (so Brandon could play alone or with his brother) and there are 3 games possible. Brandon liked playing the CD that comes with the game for help with pronunciation again and again and repeating the words for proper inflections and tone. Of course, because of his autism, he did get obsessed at repeating the sounds but found the game itself also enjoyable and was able to redirect his attention to it quite nicely. The game comes complete with a CD, board pieces, Ping cards and Kingka cards and instructions on how to set up each game. The children read the directions themselves and were able to follow the rules easily. While it may seem complicated at first, it quickly becomes clear once play begins. 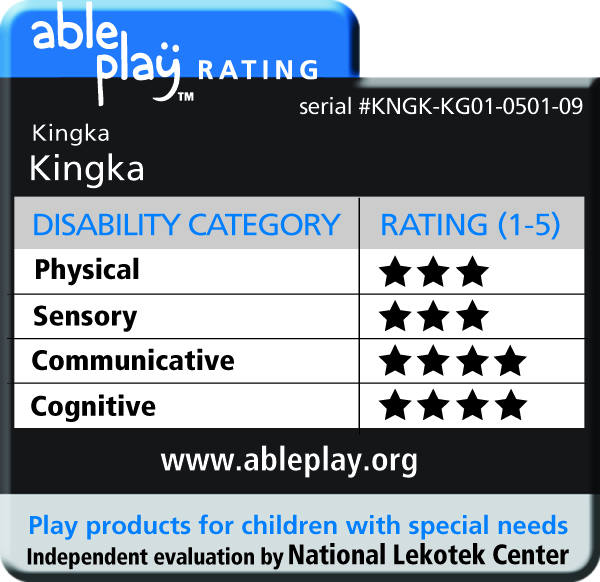 The National Lekotek Center ranked Kingka ���highly��� on its ableplay rating system with 4 stars in communicative and cognitive areas, 3 stars for physical and sensory areas. Each area has a possible total 5 star rating. Don���t forget to say ���Kingka��� to win! Kingka is available at KingkaGames, on Amazon or at specialty store locations in the United States, Canada, the UK and China. There is great news for grandparents and their grandchildren in Richmond, Virginia and around the world. Now there is a great reason for them all to play games. Kingka is a game of matching and memory that teaches players 54 basic Chinese characters and over 1,000 words. There are additional game modules that offer more than 10,000 words and phrases. This game was created to celebrate the Year of the Tiger for the Chinese New Year. Mandarin Chinese is touted as one of the most used languages in the world according to Cable News Network (CNN). Businesses, individuals, and social groups are rapidly learning this incredible language. Now it is easier than ever for grandparents and children to learn it even faster. 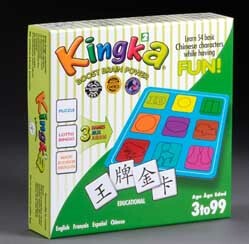 Kingka was created by a Chinese-American mom who is also a children's book author and educator in Northern New Jersey. Shoellen Lou-Hsiao invented this powerful game that introduces people of all ages to Chinese characters as the key element. No previous training or skill in speaking Chinese is necessary. What is the reason for inventing such a game? According to Lou-Hsiao, she discovered research that says children's IQ scores improved five points after learning Chinese characters. Children as young as two years old can benefit from learning the Chinese language. It stimulates spatial perception and spurs creativity. It is a game that is not only fun, but gives children a head-start on education. It also helps adults keep their minds sharp and clear. Kingka may also be extremely beneficial for children with Autism, ADD, or ADHD since it utilizes sensory integration skills. The game is specifically designed for native and non-native Chinese speakers to teach or practice with their children or grandchildren, according to Lou-Hsiao. It triggers greater response from the "right brain" which is known as the creative side of the mind. Although today's grandparents are typically younger than previous generations, they can still benefit from engaging in activities to ward off Alzheimer's and other mind debilitating disease. And since this game is designed for all ages, it's the perfect way to engage children and grandchildren while doing something for your own mind at the same time. And it's a great activity for homeschooling children too. What better way to spend time with the grandchildren than to sharpen your mind while having a fun, entertaining time together? Shenanigan's Toys near Richmond, Virginia in Charlottesville has the game in stock. It's just a short drive to Shenanigan's from Richmond. The Kingka Games website offers a lot of information and purchasing options. The Little Toy Company online offers a variety of games. Visit The Asian Parent website to make a Kingka purchase. As the game gains more popularity, you are likely to find it in more local educational toy stores. We'll be on the look-out and will inform you when more local stores stock this amazing mind-stretching game. Ever since early childhood, I have remembered the Chinese New Year greeting, "Gung Hay Fat Choy," which means "May you be prosperous." More people speak Mandarin Chinese than any other language. Just as I did, my children feel intrigued by Chinese language and culture. 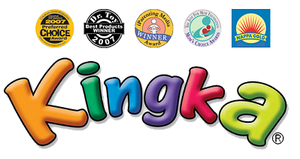 They have eagerly incorporated the language learning game, Kingka, into their learning activities. When my family gets a new game, we first take out all the parts and play with them. We read the instructions much later after we feel familiar with the parts. We did this with Kingka and found the parts easy to use creatively. My seven and four-year-old daughters matched every symbol in the box to its match on a card, as well as consulted the illustrations and words on the backs of each card. All the while, we listened to the CD pronunciation guide to get a sense of the sound of Chinese words and my daughters attempted to find the words they heard. According to the creator of Kingka, the game is designed to grow with the player. As I read through the instructions, from beginner to advanced variations, I saw that this was so. My daughters have since played the game according to directions and gained more familiarity with the symbols, words, and sounds. My four-year-old likes to copy the symbols and her older sister likes to consult the cards and give definitions. I see a lot of potential in this well-made and well-designed game for years of fun and learning, so I give it a double thumbs-up. My daughters say, "It's great!" making possible 200+ words and phrases in Mandarin Chinese! Enter: Kingka. The company offers a variety of award-winning products, designed for both native and non-native speakers, which together make for about the most inviting and inclusive Chinese language curriculum I've ever seen, not to mention one that conforms to Montessori and "Learning by Doing" education principals. Not only the first North American board game to use Chinese characters as its key element, Kingka stands out in the breadth of the information it turns into a game -- 54 basic Chinese characters in each game set turn into over 1,000 words. Additional game modules bring that up to more than 10,000 words and phrases! 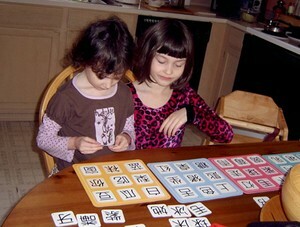 Currently, the product line includes three game sets (each containing different vocabulary but the same play-formats), six phrase card sets, one Montessori Bilingual Three Part Card set (once again, without any characters repeated from the other sets), and a "Speak Chinese Like the Chinese Do" Quantifier Card set. In addition to these there is the acclaimed book, "She Talks Funny", which explains basic Chinese grammar with examples that a young child can understand, all from within the context not just of learning language, but also empathy and multicultural understanding. There are even two complete learning system sets offered, which include complimentary teacher training provided after purchase. NOTE -- The Chinese characters as actually printed on the cards are of a much more uniform, typeface style than what is shown on the game's box-cover. While this is less culturally authentic, and disappoints my calligraphy-happy husband, it does make initial recognition of the characters easier, because lines are simply lines. 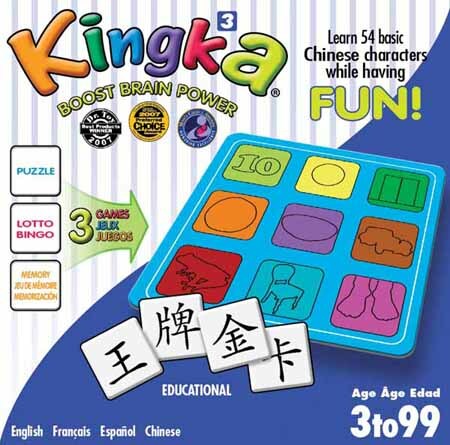 Each of the three main Kingka sets comes complete with a pronunciation guide audio CD and track search table for most efficient use, six 9"x9" board pieces, 54 Ping cards (they have the Chinese character on one side and a photographic image with quadri-lingual text words to go with it, on the other side) and 54 Kingka cards (they have the Chinese character on one side and the company logo on the other side) -- both of which are approximately 2"x2" -- two storage bags for the loose cards, and clear, simple instructions (along with tips) on how to set up each game. Game play options cover puzzle, lotto/bingo, and memory/matching style activities. In truth, for a child who does not yet "get" structured game-playing, there is also the option of first using the Ping cards simply as flashcards, a function which would still have applications in/for speech therapy and reading skills, as well as multi-lingual learning. Each set also has the benefit of being playable by 1-6 players; the sets can also be combined and mixed to accommodate a larger group or a higher fluency challenge for a small group. This makes the games ideal for everything from after school programs or play groups to classrooms or home-schooling sessions, from family time to solitary learning/play time (of particular appeal to many Autistic children). When you add in considerations like non-reliance on any particular pre-existing degree or familiarity or fluency, non-reliance on reading skills, non-age-group-specificity, sturdy game pieces that are easy for little hands to grip (though they are small enough that the games must come with a choking hazard warning and the disclaimer that they are not intended for children under the age of 3), and the fact that you can play the included Bingo-style game in four different languages (see each product description for language option variations) with every Kingka set, that opens up a world of possibilities....literally....in terms of who can benefit from playing, who can enjoy playing with whom (with everyone getting more than just the company out of it), and ways in which learning from the games can be applied. Fellow Special Needs Kids Examiner, Heather Sedlock also reviewed one of the Kingka games (with her Autistic children in mind), as has Richmond Grandparenting Examiner, Rhonda Day. A neat web-tool for converting simplified to traditional Chinese characters, and vice-versa. While the Kingka games are available in both writing systems, you never know when you'll want to grab a do-it-yourself opportunity for beginning something, while you wait for an order to come in. There are a great many resources available when it comes to learning about and navigating issues related to finding job/careers for the disabled. You can find even more if you do a search related to job issues and any specific disability, such as jobs for those with Autism. ©2006-2010 Kingka LLC. All Rights Reserved.